The position of Russia as a main gas transiter from Central Asia to Europe is strengthened as far as tension among key players of the region grows. Azerbaijanian MFA recently criticized plans of official Ashkhabad to establish a naval base on Caspian Sea. Escalation of media war between Turkmenistan and Azerbaijan lasting since the end of July decreases chances of Nabucco project execution called to be alternative to Russian hydrocarbon transport routes. However, experts admit that the conflict escalation may disserve Russian interests, if international organizations are involved in resolution of Caspian Sea demarcation. "We want to see Caspian Sea as a region of peace and cooperation, i.e. demilitarized, but not reverse", Azerbaijan's Foreign Ministry Spokesman Elkhan Polukhov said recently commenting Ashkhabad's plans to establish a naval base on Caspian Sea coast. "Azerbaijan supports the disarmament of the Caspian region", the MFA representative remarked. That was an operational reaction of official Baku on the statement of Turkmenian President Gurbanguly Berdimuhammedov declared the plans to establish naval base on Caspian Sea for protection of republic's sea border. "Under my order a special work on strengthening of our sea border and guard of Turkmenian part of Caspian Sea shore from violence is currently conducted", explained the President in State Security Council session. According to his words, an effective maritime positional and optical check system is going to be created in Turkmenistan. Furthermore, as Berdimuhammedov said, the republic's border guard service is purchasing modern high-speed patrol boats; two advanced ships armed with missiles to be bought for national Navy. To use those forces effectively in combat conditions, the creation of naval base is essential. Baku and Ashkhabad have been debating about possession of hydrocarbonic resources Caspian shelf since the USSR collapsed. Currently, the antagonisms between them have intensified again, taking shape of verbal armaments race. As Turkmenian leader said on July, 24, searching and making mutually acceptable decisions in this area are considerably slowed by specific position of Azerbaijan unilaterally started exploitation of disputed oil and gas fields Omar and Osman and its pretensions on Serdar field. 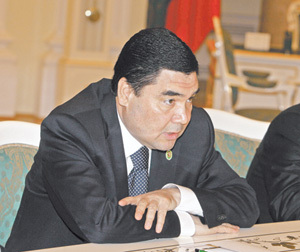 "That kind of unilateral actions on Caspian Sea is unacceptable for Turkmenistan, especially exploitation of areas non-agreed among the states concerned", stated Berdimuhammedov having added that upon the legislation active since USSR those areas are within the territory of Turkmenistan. Berdimuhammedov gave order to inform international companies exploring disputed areas that Turkmenistan will claim compensation for their actions if the Permanent Court of Arbitration takes up Ashkhabad's quarrel. Turkmenistan's plans on strengthening its naval forces and creation of naval infrastructure cause nervous reaction also among Azerbaijanian experts. As it was said to Interfax by Rustam Mamedov, international law professor of Baku State University, Turkmenistan's intentions to create naval forces on Caspian Sea may cause a new flashpoint in the region. "If it's impossible to prevent that illogical and injudicious move, further escalation of military tension and new flashpoints may happen", said Mamedov. "Turkmenistan is absolutely unneedful of such prospects, I guess. Moreover, no matter how intensively Turkmenistan may arm itself, it will never reach Azerbaijanian level of armaments in Caspian region". We remark that despite statements of demilitarization, Azerbaijan itself is building up of its power. In particular, the President Ilkham Aliev ordered on July, 22 to start in 2010 the construction of shipyard capable to produce not only takers for oil transfer from Caspian east coast to Azerbaijan, but also military-kind ships. In expert's opinion, current tension escalation between Baku and Ashkhabad is playing into Russia's hands first, since that is the reason for slowing of Nabucco project development supposed to deliver Central Asian gas to Europe leaving traditional route aside. Correspondingly, the chances of Yuzhny Potok, ambitious and expensive project and Nabucco's direct competitor are on the rise. "If the confrontation between Azerbaijan and Turkmenistan is intensifying, it would be not barely Nabucco's great problem but invincible obstacle to its implementation", comments Igor Ivakhnenko, Caspian region expert of RusEnergy consulting company. "However, I don't think the standoff would be so dramatic. Presently we observe a kind of a tension escalation, but it is futureless since none of the parties is ready for naval warfare. Moreover, the certain part of Turkmenian hydrocarbon export passes Azerbaijanian ports, and Ashkhabad will unlikely refuse this route", the analyst explains. Besides, the conflict escalation may have quite negative repercussions for Moscow, supposes Dmitry Aleksandrov, top analyst of SIA Financial Bridge. "As soon as the third force – whether it is European Union, UN etc. – intervenes in the dispute, Russia may instantly come off a loser", he explains. "The prerequisites to that exist, considering Turkmenistan's appeal to international arbitration. Russia carries great weight if the Caspian issue is decided among neighbouring countries, but in case of international organizations involve in the conflict, Russia's exclusive position may be found very doubtful".